Why is the cut-to-grain angle not taken into account when designing a tapered beam? 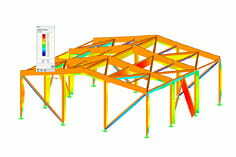 You have probably carried out the design in RF‑/TIMBER Pro according to DIN 1052:2008 and used a cut-to-grain angle of less than 3° (see Figure 01). According to Section 10.4.1 (1) of DIN 1052, such a cut-to-grain angle does not need to be considered. If you switch the design to the current DIN EN 1995 (see Figure 02), the design will also be carried out for the angle of less than 3°. Furthermore, the module allows you to analyse transversal tension stress in the apex etc., according to the Section 6.4.3 ff. of the Eurocode. This procedure is explained in detail in the webinar.